Opera Mail automatically appends a signature to every email that it sends. There is a separate signature for each email account. A typical signature will contain your name, a polite message (e.g. Kind Regards) and company logo and contact details. 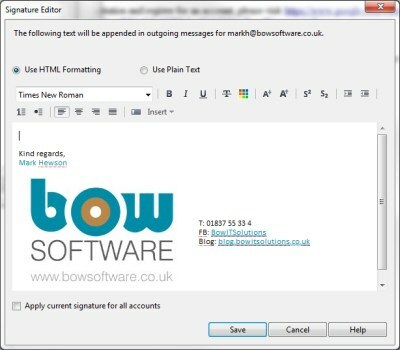 In Opera 12, it is possible to set your email signature as HTML. It is recommended that you edit and save the HTML first, as it is not easy to later edit the HTML in Opera. If you are adding images to the signature, you may want to base 64 encode them, so that the image is sent embedded in the email and not loaded remotely when the email is opened. Remote loading via a direct link in the signature will have bandwidth implications. There are free tools (www.base64-image.de) to encode in base 64, the result being some text you can cut and paste. To add the encoded image use a HTML image tag and set the src tag value to “data:image/jpeg;base64,”, followed by the encoded byte string. From the Opera Main Menu, select "Mail and Chat Accounts..."
In the third combobox, select "Prefer HTML formatting"
Click the "Edit Signature..." button. At the end of the editor toolbar, select the Insert drop down list and select "<> HTML..."
Test your email signature by composing a short email and sending it to another email address you have access to. If all works, you should see the signature and image correctly. You may need to allow the image through Spam blocking filter of your email client or web email provider.